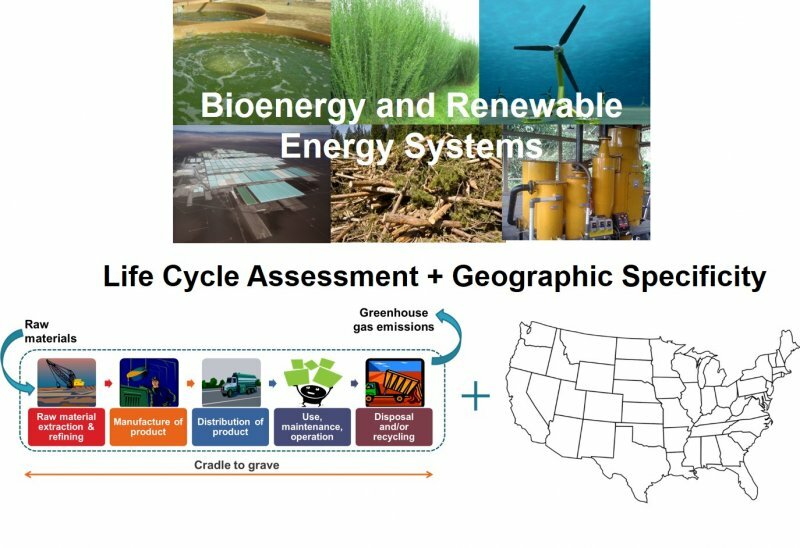 Life cycle assessment (LCA) is a valuable tool to measure the cradle-to-grave climate change impacts of sustainable energy systems that are planned to replace conventional fossil energy-based systems. The field of LCA is evolving to incorporate increased geographic specificity by utilizing GIS and satellite data and conducting site-specific analyses, which has led to important conclusions for bioenergy and renewable energy systems. Dr. Fortier will cover how geographic data has been integrated into LCAs of various energy systems through her research. Methods were developed to incorporate land use and albedo change impacts into a geographically specific LCA of green gasoline from wastewater microalgae. The results of this geographically specific algal biofuel LCA demonstrate the importance of direct land use and albedo change impacts to the sustainability of algal green gasoline and how these effects vary widely by ecoregion in the United States. Substantial differences in geographically specific climate change impacts can also be observed at smaller resolutions, as demonstrated through a willow biomass LCA performed by tax parcel and county in upstate New York. In this study, the soil carbon change impacts and transportation differences by site affect the life cycle climate change impacts of willow biomass delivered to a bioenergy power plant. Most recently, Dr. Fortier’s research group has completed the first study that shows how the carbon footprint of an ocean energy system changes based on the location installed. Although its importance has now been demonstrated for bioenergy LCAs, geographically specific methodology is novel to LCAs of mechanical energy systems like tidal turbines. The results of this geographic LCA indicate that even in some sites that were identified as “hotspots” for tidal energy deployment on US coasts, electricity from tidal turbines can have higher life cycle greenhouse gas emissions than electricity from natural gas (500 g CO2eq/kWh) and coal power plants (1000 g CO2eq/kWh) due to low electricity generation over the tidal turbine lifetime relative to the emissions arising from the production of the infrastructure and materials. As we improve the geographic specificity of LCA, our collective understanding of how the sustainability of bioenergy and renewable energy systems changes by location also improves and allows for the siting of new systems that optimize a reduction in life cycle climate change impacts. Dr. Marie-Odile Fortier is an Assistant Professor in the Department of Civil and Environmental Engineering at the University of California, Merced. From 2015 to 2018, she was an Assistant Professor at the State University of New York College of Environmental Science and Forestry (SUNY ESF) in the Department of Forest and Natural Resources Management, contributing to the Sustainable Energy Management program. She has a PhD in Environmental Engineering from the University of Kansas (2015) and a Bachelor’s degree in Environmental Engineering and Sciences from the University of Florida (2010). She was awarded the college-wide 2017 Distinguished Teaching Award at SUNY ESF. Dr. Fortier’s research focuses on the geographically specific life cycle environmental impacts of sustainable energy systems, including land use change and albedo change impacts. She uses life cycle assessment, GIS, and mathematical modeling to investigate whether the carbon footprint of different energy systems varies spatially and she develops new methodology to increase applications of life cycle assessment to sustainable energy planning.